Ruth Ellis was the last woman to be hanged in Britain. Her execution came amid great controversy, with a petition of several thousand signatures asking for her reprieve ignored by the then Home Secretary. The crime for which Ruth Ellis was executed was the wilful murder of her lover, David Blakely. She fired six shots at him as he emerged from the Magdala public house in South Hill Park, North London on Easter Sunday. Ellis fired one shot from point blank range as Blakely writhed on the ground. She made no attempt to escape, instead asking a witness to call the police. The controversy in the case arises from the failure to present evidence about her state of mind, the way her image in the court probably told against her, and the fact that the participation of her other lover in the act was totally ignored. Ruth Ellis’s background was not a happy one. A father who allegedly raped her, a child by a married Canadian serviceman who abandoned her, an alcoholic husband who was violent towards her, and a career as a night club ‘hostess’ before she graduated to managing a club. And she was addicted to anti-depressants. In David Blakely she seemed finally to have struck lucky. He was from a moneyed background; an ex-public schoolboy three years younger than Ellis, he was a handsome and dashing racing driver. But he was also hugely jealous, was rapidly blowing his inheritance, and his constant surveillance of Ellis at work was damaging her business. And he was – as she knew – homosexual. Ellis did give him cause for jealousy, having an older lover, Desmond Cussen. Blakely too was probably having other affairs – Ellis suspected him of pursuing the nanny of some friends, he certainly kept another mistress, and may have been having homosexual liaisons too. Their life together was sordid and full of betrayals. The shooting took place just days after the 28-year-old Ellis had miscarried following an argument with Blakely during which he punched her in the stomach. It is her possible state of mind after this miscarriage that leads many contemporary writers to believe she should have been able to prove diminished responsibility. Her defence team failed to even bring the attack and miscarriage into the picture. Before her execution she said she felt like it was another person shooting Blakely. Ellis appeared in court with platinum blonde hair and dressed in a stylish black suit with white blouse, not a look designed to evoke the sympathy of the jury. This look was supposedly the idea of her defence team. The third element of her defence, or missing defence, that supporters of Ellis bring out as a mitigating circumstance is her allegation after the trial that a man (taken to be her lover Cussen) provided the revolver, showed her how to use it, and drove her to the pub where she killed Blakely. Nobody else was ever brought to justice in the case. It is possible that a modern court would reach a verdict of manslaughter, but the Court of Appeal rejected an appeal on the case recently, based on the law as it stood in 1955. And supporters of Ellis seem content to overlook the cold-blooded nature of the killing, especially the final shot, and her crystal clear admission in court that she fully intended to kill. The jury only needed 14 minutes to reach its guilty verdict. That she did not appeal against her conviction is a further mystery. Because of this she spent less than a month awaiting execution. The night before her execution Ellis had to listen to the gallows being erected. A crowd gathered outside Holloway Prison, some people barging through police lines to get nearer to her, banging on the doors of the jail in fury. Home Secretary Major Lloyd George turned down pleas for clemency – the murder and arraignment occurred during a General Election campaign in which his party, the Conservatives, took as so often a strong law and order stance. Clemency for Ellis might have been expected given the circumstances, and the fact that 90 per cent of women sentenced to death in the 20th century had their sentences commuted. Albert Pierrepoint came down from Preston to carry out the execution. At 9am on July 13 1955, the crowd of perhaps 1,000 outside the prison fell silent as the moment arrived. She had been weighed at 103lbs, so a drop of 8’ 4” was calculated and set, the rope stretched overnight with a sandbag to ensure there was no give left in it. Pierrepoint pinned her arms in the cell, then led her to the gallows just 15 feet away where a cotton hood was placed over her head and the noose tightened. From cell to the fatal drop as he pushed the lever to open the trap, Pierrepoint effected the execution in some 12 seconds. As was standard practice to ensure death had occurred, her body was left hanging for an hour. There were no doubts Ellis killed Blakely. But there were and are serious concerns about whether she received justice. These concerns fed into the debate at the end of the fifties and in the early sixties about capital punishment. 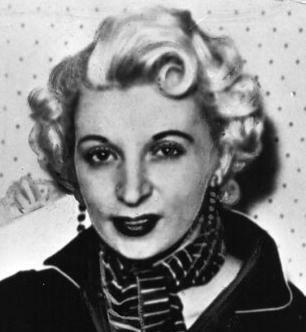 Ruth Ellis was to be the last woman to be executed in Britain. Just thought I’d leave a comment about these posts, very interesting and I’m enjoying receiving them daily, keep them coming.